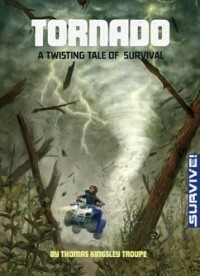 Tornado: A Twisting Tale of Survival | Thomas Kingsley Troupe — Writer. Filmmaker. Action Hero. Andy and her twin brother Tony are four-wheeling in the woods near their family cabin when they notice the sky has turned a sickly shade of green. Moments later, the sky erupts into a raucous thunderstorm and they’re forced to take cover beneath an abandoned Ranger tower. When the sky grows eerily calm, they quickly get back on their four-wheelers and race home–only to find a massive funnel cloud blocking their way. The twins dodge falling trees and debris in search of shelter only to face an even bigger dilemma: is it safer to keep moving, or hunker down beneath less than ideal cover?